The Fate of Achilles looks into the opposing forces of human strength and courage versus war and greed. Achilles is the son of the sea goddess Thetis and mortal King Pelleus. Before their marriage, both Zeus and Poseidon had fallen in love with Thetis, a beautiful goddess. Not being able to come to an agreement regarding who should have her, they visit the goddess of the eternal laws for a decision. She tells them that if either marries Thetis, she will have a son, and he will be more powerful than both of them. Well, that is not satisfactory to either of them, so they change Achilles’ fate by having Thetis marry a mortal and thus protect their futures. When Achilles is born, Thetis dips him in the river Styx to make him immortal, but only one part of him is left dry and thus unprotected: his heel. Other gods also find ways to help Achilles become invulnerable. When he becomes a man, war will test his strength, courage, and mortality. Ulysses asks Achilles to help fight against the Trojans who abduct Helen, King Agamemnon’s brother’s wife. He wants him to defend the honor of Achaeans. Achilles willingly joins the fight, but Thetis comes to stop him, giving him a warning. She tells him that if he fights he will find glory, but his life will end; if he does not fight, he will live a long life. Achilles decides not to heed the warning and goes to war against the Trojans. Achilles is successful in the brutal battles. But he comes to a crossroads when he is dishonored by the very man who has asked for his help in war. What will he do to avenge that honor? Achilles was born with amazing gifts. Many gods had tried to make him invulnerable—including Chiron, Thetis, and Hephaestus—but Achilles is ultimately still mortal, which was why certain gods look after him and protect him. He accepts all the knowledge the gods instill in him, yet his emotions get the better of him and take him down a road on which he cannot turn back. The Fate of Achilles is a fascinating story about Achilles’s journey and downfall. The illustrations augment the dramatic, dark text. Children of all ages will enjoy this 32-page hardcover picture book. 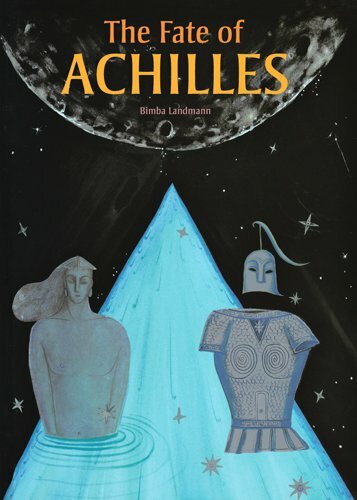 Fans of mythology will love not just the story of the great Achilles, but the marginal conversations between the Fates, whispering to the reader clues about what will soon unfold.